Typically, port forwards are used to forward requests that arrive at an external network interface to a particular network host in an internal network zone. It is common to think of such requests arriving from hosts on the Internet; however, port forwards can be used to forward any type of traffic that arrives at an interface, regardless of whether the interface connects to the Internet or some other network zone. If required, you can also create port forwarding rules for requests from an internal network addresses. Forward traffic if it arrived at a particular interface, or alias. Forward traffic if it arrived at a particular port, or range of ports. A port forward will send traffic to a specific destination IP. A port forward will send traffic to a specific destination port. For example, you can create a port forward rule to forward HTTP requests on port 80 to a web server listening on port 81 in a Demilitarized Zone (DMZ). If the web server has an IP address of 192.168.2.60, you can create a port forward rule to forward all port 80 TCP traffic to port 81 on 192.168.2.60. Note: It is important to consider the security implications of each new port forward rule. Any network is only as secure as the services exposed upon it. Port forwards allow unknown hosts from the external network to access a particular internal host. If a cracker manages to break into a host that they have been forwarded to, they may gain access to other hosts in the network. For this reason, we recommend that all port forwards are directed towards hosts in isolated network zones, that preferably contain no confidential or security-sensitive network hosts. Use the Network > Filtering > Zone bridging page to ensure that the target host of the port forward is contained within a suitably isolated network, that is, a DMZ scenario. 1. Go to Network > Configuration > Port forwards. 2. Click Add new port forward. • Status — New port forwarding rules are enabled by default. Clear the check box to create a disabled rule. • Client IPs — Choose whether to forward traffic from Any client IP address, or from a specific list. To route traffic from a specific IP address, or range of IP addresses, select User defined. Either enter the IP addresses, address range, or subnet ranges individually in the box provided, or click the down arrow and select the relevant IP addresses, or ranges. • Local IP — From the drop-down list, select the external interface that this rule applies to. • Protocol — From the drop-down list, select the network protocol for this rule. For example, to port forward an HTTP request, which is a TCP-based protocol, select TCP. • Local port — Choose whether to forward received traffic to all destination ports (Any), or to a specific port. To forward traffic to a specific port, either select it from the Predefined drop-down list, or enter it into the User defined box. Note that you can specify a range of ports using the format: <lowest_port_number>:<highest_port_number>. • Target IPs — Either enter the IP addresses, address range, or subnet to forward traffic to in the box provided, or click the down arrow and select the relevant IP addresses or ranges. If multiple IP addresses or ranges have been specified, traffic forwarded to them is automatically load balanced. • Target port — Select Preserve to forward traffic to the same port number it originated from. To use a different port number, enter it in the box provided. • Log connections — Select to log all port forwarded traffic. • IPS — Select to deploy intrusion prevention. For more information, Managing the Intrusion System . An additional button, Show comments, appears on the Port forwards table if any comments are configured. Clicking this displays configured comments under the rule. 2. From the Port forwards table, locate and highlight the relevant rule. 4. Edit the configuration as required. 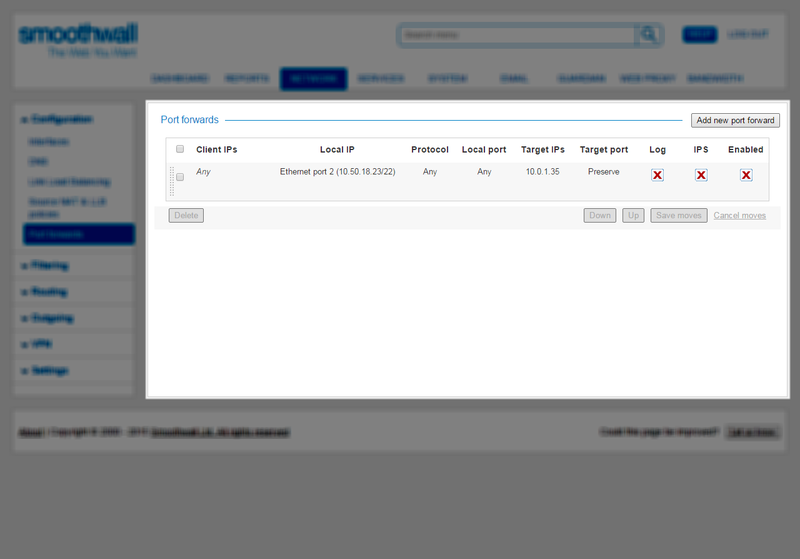 For a detailed description of each setting, see Creating Port Forward Rules . 1. Go to Network > Configuration > Port fowards. 2. From the Port forwards table, mark each rule for deletion by selecting the check box to the left of Client IPs.